I got on the phone with Steve Maloney and Stephen Kirkpatrick the other day. They were on Shark Tank last week and I was doing an interview for The Shark Tank Blog. 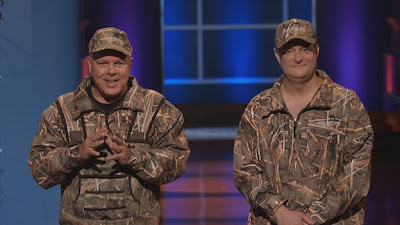 The two "huntrepreneurs" developed a proprietary, photographic process to put environmentally realistic camouflage patterns on just about anything. We talked about their Shark Tank appearance, business prospects, hunting, and the visit they got from Phil Bryant, the Governor of Mississippi. Steve and Stephen are enjoying the Shark Tank Effect and have big things ahead of them! Steve Maloney: "I'm a mustard guy." Stephen Kirkpatrick: "I get onions, chili, cheese, ketchup, mustard, and a lot of napkins." I just hope Mr. Kirkpatrick doesn't bring his ketchup laden hot dogs into the duck blind with him. It's a known fact that 9 out of 10 ducks are repulsed by ketchup on a hot dog!